Spent lunch today with a leader who is struggling with what might be called a mutiny. This individual is leading a big project, a project that not all departments feel should be done the way the leader feels the project should be done. Other departments are making life miserable for this individual. The vendor community and blogosphere are beating companies up over "silo" based approaches to leadership, blaming business-to-consumer companies for shortcomings (in some instances, vendors are publicly blasting the very companies that pay their freight --- I saw this happen just last week --- not a great way for a vendor to endear themselves to a client). It is my opinion, having worked in leadership roles in some of the biggest companies in America, that org structure and silos have very little to do with coordinated marketing activities or brilliant execution of projects. Nope, whether things get done or not have everything to do with how people work together. Explain to me why Brett Favre, given a motley crew of rookies and one of the worst running games in history, has led his team to a 4-0 record and an average of 26 points a game? Strong leaders are able to motivate people. They align people along common goals and objectives, and demonstrate to all how everybody benefits. They motivate people to accomplish great things. They give credit to others. And regardless of org structure, they get things done. Catalog Marketing, E-Mail Marketing, Search Marketing, Online Marketing, Multichannel Marketing ... all would benefit from the process of developing leaders. We need fewer folks leading contentious environments. We need more leaders. Let's assume that the e-mail marketing program is reasonably basic in nature. In other words, the customer can opt-in on the website, or if the customer purchases online, the customer is automatically opted-in to the e-mail program, and can elect to opt-out at any time. The e-mail marketing program has 1,000,000 addresses. The company does not execute targeted campaigns (i..e. unique creative to different customers with different interests), executes a weekly campaign to all 1,000,000 addresses, and generates on average $0.20 per e-mail. The program typically offers free shipping as a purchase incentive. The company has tested targeted versions of e-mail campaigns, observing a 35% increase in productivity. Here's the question, folks. So many e-mail marketers feel that e-mail does not get its fair share of marketing dollars. In this case, what should the e-mail marketing investment be, what are the tactics this company should employ, and what is the expected increase in demand and profit (profit = 0.35 * demand - marketing cost)? Please let my readers know what you would do, how much you would spend, and what the financial benefit would be to this company. E-Commerce: More Like Direct Marketing, Or More Like Retail Stores? Had a discussion this evening about the future of e-commerce. One of the topics was "which business model has the best chance to succeed, long-term ... catalog/online, online pureplay, online/retail". I vote online pureplay, followed by catalog/online. I simply don't buy the "multichannel" stuff we're fed by vendors and research report writers. All of us who actually are asked to measure retail/online customer dynamics know the real truth ... retail customers are not likely to cross-over and buy online ... whereas online customers are very likely to buy in stores. This means the online/retail business model is ultimately dependent upon retail success ... and retail has way too much square footage for all retailers to be healthy. One could ask a more interesting question. Is e-commerce more like traditional direct marketing, or more like traditional retail stores? I argue that e-commerce is more like traditional retail stores. Traditional direct marketing is all about identifying an audience, then blasting a message to the audience. E-commerce (outside of e-mail) depends far more on the tenants of retailing than direct marketing. For e-commerce, Google is the mall owner. Do you ever feel like nobody appreciates the marketing work you do? "Back in the day", i.e. Nordstrom 2001, I inherited the circulation team responsible for mailing catalogs (hang in there e-mail and search marketers, the punchline is coming). One of my first tasks was to investigate a sale catalog that missed expectations by 40%. That's FORTY percent, folks. I asked to see the selection criteria used to determine which customer segments received the catalog. I was told that the merchant responsible for sale/clearance merchandise decided who received the catalog. That's right, the merchant, a strong-willed individual, wanted control over who received "his" catalog, and somehow convinced the circulation director that "he" should decide who received the catalog. The merchant decided to pick customers based on age/income/demographics, not based on prior sale/clearance purchase activity, not based on recent purchase activity, not based on loyal customers who spent a ton of money in the past. So the circulation team gave him his wish. And "his" catalog missed expectations by 40%. Soon after that debacle, we had to pick customers for yet another sale/clearance catalog. We reverted back to having the circulation experts do the work they were trained to do. We got back the 40% we lost in the prior sale/clearance catalog. Catalog, Database, E-Mail, Search, and Online Marketers don't always tell a compelling story. These folks do hard work. Not many people notice. Online Sales Driven By Catalog Mailings = $15,000,000. Online Sales Driven By E-Mail Marketing = $8,000,000. Online Sales Driven By Paid Search Marketing = $5,000,000. Online Sales Driven By Natural/Organic Search = $3,000,000. Online Sales Driven By Affiliates = $3,000,000. Online Sales Driven By Portal Advertising = $2,000,000. Online Sales Driven By Shopping Comparison Sites = $2,000,000. All Other Online Sales = $13,000,000. A profit and loss statement is created for the $37,000,000 driven by the marketing team. Another profit and loss statement is created for the $13,000,000 created by the rest of the company. Of course, the results are exaggerated. But they prove a point! 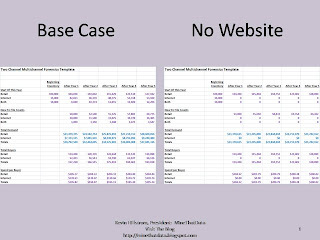 If the marketing team did not exist, a $50,000,000 website becomes a $13,000,000 website. Regardless how enticing the merchandise is, regardless how powerful the "brand" is, a $50,000,000 website becomes a $13,000,000 website. If the marketing team stunk (using the Nordstrom example from the start of this post), the $37,000,000 driven by the marketing team would only be $22,000,000. No marketing at all yields $13,000,000 of annual online sales. Poor marketing adds $22,000,000, yielding $35,000,000 total. Good people doing good marketing add another $15,000,000, yielding the annual total of $50,000,000. And gifted marketers are worth even more. The e-mail community is on a mission to prove it is "right". The community continues to use the "ROI" metric as a way to shoot down paid search, portal advertising, shopping comparison sites, affiliates, and catalog marketers. ROI is typically measured as the "profit dollars obtained in a campaign divided by the marketing cost to execute the campaign". E-mail depends upon two very important metrics --- one dramatically working in its favor, one dramatically working against e-mail. After factoring in staffing levels (which may be comparable for online advertising, catalog advertising, e-mail and search marketing), the incremental cost to do e-mail marketing is low --- almost zero. By default, this yields a ridiculously high and meaningless "ROI" metric --- the metric e-mail advocates use to defend investment in e-mail ROI. The metric working against e-mail is sales per contact. E-mail is awful at generating sales volume per contact. Catalogs and paid search are great at generating sales volume per contact/click. The dynamics of cataloging and search marketing are very different than the dynamics of e-mail marketing. You never hear e-mail advocates talk about a $0.20 demand per e-mail delivered. Nope. E-mail advocates scan a profit and loss statement like this, pick out the two metrics that look the best (ROI and Cost per Order), and then beat up folks who work on other marketing tactics. Chief Marketing Officers are pressured to drive sales now --- or they lose their job. It's hard to drive sales at $0.20 per contact, when paid search and cataloging drive so much more volume than e-mail marketing. Dive in head-first, and do your best to maximize all marketing activities. You should have a great e-mail program, using best practices and targeting strategies and personalization to maximize ROI. It is absolutely worth the effort! Just listen with a grain of salt when you read the research reports and vendor marketing articles that tell you that e-mail has the best ROI, articles and reports that beat up others to justify investment in e-mail marketing. Look at the net sales and profit dollars generated by each marketing activity, and let those metrics speak for themselves. E-mail will be able to stand on its own merits. On Friday, I'm speaking at the Direct Marketing Educational Foundation symposium at Villanova University. I'll talk about the importance of building marketing accountability into the marketing curriculum, especially as it relates to Multichannel Forensics. For me, this speaking opportunity represents a unique turn of events. Back in 1988, I was a Senior at the University of Wisconsin, completing a Bachelors Degree in Statistics. As I entered my final semester, I was required to meet with an adviser, a professor who would give career and educational advice. We spoke for a few minutes. The adviser asked "What are your plans after you graduate?" I proudly exclaimed that "I wanted to get a full-time job where I can use my degree." This individual replied ... "You'll never get a job." Who knows how much my face contorted after hearing those words? My adviser suggested that it was next to impossible to get a job with a BS in Stats --- he advised that I buckle down, spend two more years earning an MS in Stats, and then hit the work force armed with the proper educational background necessary to provide value to corporate America. Eight weeks after graduating from the University of Wisconsin, armed with a useless BS in Statistics, I began my career at the Garst Seed Company as a Statistical Analyst. Since that first day of work, I joined ranks with the rest of you ... all of us are in this together, all of us are told of our failures, our weaknesses, by (hopefully) well-meaning leaders. In 1992, the CEO at Lands' End suggested I couldn't manage people because I didn't have a Masters Degree. 1n 1998, a finance director at Eddie Bauer suggested I couldn't implement a new catalog strategy because I didn't have the perspective (i.e. experience) to understand key business issues. In 2002, the President of Nordstrom Direct told me I didn't know anything about catalog circulation. In 2005, the President of Nordstrom told me I wasn't qualified to run a direct-to-consumer division because I didn't have merchandising experience. In 2007, an EVP at Nordstrom told me I wasn't qualified to do the type of customer research necessary to provide actionable merchandising insights. Had I listened to these leaders, I wouldn't be sharing information with educators and students this Friday. Heck, I'd never have secured a job if I listened to my college adviser. Every one of you has to deal with somebody who wants to tell you the things you cannot do, somebody who wants to share all of your weaknesses with you. Don't listen to these people. If you are a catalog marketer, don't listen to the twenty-nine year-old online marketing whiz who thinks paper-based advertising should be mothballed. If you are an e-mail marketer, don't listen to the Chief Marketing Officer blather about the fact that she never opens e-mail marketing campaigns from other retailers because e-mail marketing is 'irrelevant' in her mind. If you are an online or search marketer, don't listen to crusty leaders who marginalize your highly relevant and specialized experience because they perceive you are, overall, inexperienced. If you are a web analytics professional, don't get discouraged by folks who discount your work because it only focuses on one channel. If you are a social media expert in your company, don't listen to a generation of leaders who don't know the difference between an RSS feed and chicken feed, folks who demean you because of their ignorance. I can assure you that my message to the good folks at Villanova University will be filled with optimism, a message very different than one I heard from an adviser who suggested nineteen years ago that I'd never get a job. Does A Website Drive Sales In Retail Stores? One of the more flummoxing issues facing multichannel retailers is quantification of the sales that a website drives to a retail store. There aren't a lot of "best practices" for quantifying this issue. Some folks want to give the website credit for any purchase initiated online. For instance, if a customer ordered online, and picked-up the item in-store, some folks want to give the website "credit" for that order. Some feel that any retail purchase that was researched online deserves to be credited, at least in-part, to the online channel. Retail folks will claim that without stores, the website never would have existed, and therefore, the stores should get credit for all orders, even orders that happen online. Many retailers include online sales in their comp store sales calculation --- artificially propping up tepid retail comps with +25% online growth. Read the 10-K statements issued by retailers, you'll see that this is a common practice. Multichannel Forensics can be used to simulate what might happen if a website no longer existed, was no longer there to support store sales. Using this free spreadsheet, the analyst can plug in retail/online metrics, view the forecast, then zero-out the online portion of the business. In the attached example, retail sales were growing at about four percent per year. Once the website is shut down, the simulation suggests that retail sales stop growing. Of course, all web sales disappear as well. Theoretically, some assumptions can be made for perceived cannibalization between retail and online sales. In lieu of the actual, quantifiable metrics, this example shows that the website probably has a real, long-term impact on retail sales. Plug the dynamics of your business into the spreadsheet. You can get an introductory view into the impact your website might have on retail growth. You send a catalog to customers on Monday, expecting to get $3.00 demand per catalog. Next, you send an e-mail campaign to customers on Wednesday, expecting to yield $0.20 demand per e-mail sent. A customer receives both the catalog, and the e-mail campaign. The customer does not open the e-mail campaign, does not click-through the e-mail to the website. On Sunday, the customer visits the website, and chooses to order merchandise. The customer spends $100.00. I have a feeling that the catalog marketers want credit for the full $100.00 order. I want to hear from you, the e-mail marketer. How much of the $100.00 order should be allocated to the marketing activity you executed on Wednesday? One of your frequently asked questions about Multichannel Forensics is this ... "Do you have a spreadsheet I can borrow that does the analysis for me?" If you manage a two-channel (or two-brand or two-product) business, I have a spreadsheet for you. Download this spreadsheet, and you are just 48 easy steps away from understanding the dynamics of your two-channel business. Open the spreadsheet. Page down to cell K48, and enter each of the 48 metrics readily available from your database marketing team, or the forecast you maintain for new customers by channel. Once you've completed this task, cells A6 - G28 illustrate the forecasted five year trajectory of your business! Cells I4 - N14 illustrate the Migration Probability Table necessary for understanding the true underlying dynamics of your business. Understand two-channel dynamics, and you can build a three-channel worksheet. Beyond three channels, things get interesting, that's where a simulation tool makes life easier. Catalogers that sell branded merchandise (merchandise that they did not design and source themselves, merchandise they purchase from another branded vendor) have challenging decisions to make. Do you offer merchandise you know will sell very well, and pay for the cost of mailing the pages out of your budget? Or, do you accept funding from the branded vendor, allowing them to feature their merchandise on your spread, incurring no paper/postage/printing costs? Unless you are selling iPods or HP computers, it is common for co-op funded merchandise to perform worse (often much worse) than the merchandise you would choose to feature in a catalog. Which spread would you rather feature in your catalog? The spread that causes 1,159 customers to purchase, generating $80,000 demand and $4,672 profit? The spread that is paid for by vendors, causing 580 customers to purchase, generating $40,000 demand and $10,336 profit? (Hint: You have to determine the long-term impact of generating less sales and more profit on your customer file. How would you do that?). If you'd like a quick read about the story of a creative individual who started a media empire, only to have it dramatically crumble within a short few years, give Me, Myself & Bob a try. Written by Phil Vischer, the creator of VeggieTales, the book dramatically illustrates why a business dies without a healthy balance of creativity and fiscal discipline. This week, catalogers attending NEMOA heard industry veteran Bill LaPierre apparently criticize the purveyors of paper for a lack of creativity in their marketing activities. I fear that catalog and (especially) online marketing creativity is being smothered by technology. Fiscal discipline is better than it was during the go-go days of the internet bubble. Creatively, we're struggling. A business leader recently told me it would take eighteen months for the technology team to make the appropriate changes to the website so that the creative team could present merchandise the way the creative team wanted to present merchandise. And if the pundits are right, if we have to integrate marketing, merchandising and creative strategies in our online and catalog channels, then the whole darn thing hinges on our ability to integrate the technology folks, creative folks, and marketing folks. Who hasn't enjoyed the sandwich popularly known as the "BLT" (Bacon, Lettuce and Tomato)? You take three ingredients that, on their own merits, are acceptable. When you combine the three ingredients, however, you end up with a classic. This effect is known as an "interaction". Interactions occur when elements combine to have a bigger impact than when evaluated on their own merits. In the case of a BLT, imagine that each ingredient gets a score of "3". The impact isn't additive ... 3 + 3 + 3 = 9. The impact is multiplicative ... 3 * 3 * 3 = 27! So often, we look at straight averages. We compare customers who did "x" (i.e. multichannel customers are the best customers), vs. customers who did not do "x". When we execute tests, we execute A/B splits, allowing us to learn if one factor is better than another. We learn about the many opportunities our online, catalog and retail businesses have when we do A/B/C/D splits ... testing all sixteen combinations of four factors. In real life, excellence occurs when factors "interact". We need to structure our jobs to find the factors that interact favorably. Please click on the image to enlarge it (it may be a challenge to see the small numbers in the chart, FYI). Our industry loves to tell us that we need to have a viable Gift Card program for the Christmas shopping season. Our industry seldom tells us how customers who purchase Gift Cards for others behave, long-term. The Multichannel Forensics framework is well-suited to understand if customers who purchase Gift Cards for others behave, long-term. The attached simulations illustrate what you want to see happen. Customer purchases a Gift Card for another individual. Other individual (not illustrated above) redeems Gift Card for merchandise. Customer who purchases a gift card becomes more loyal, and spends more, long-term, than customers who don't purchase Gift Cards for others. 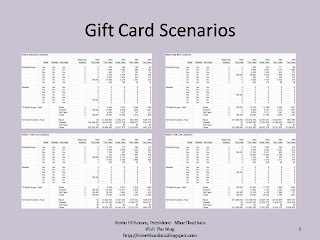 You have an opportunity to analyze how customers who actually purchase Gift Cards behave, long-term, vs. other customers. Hopefully, you'll find that your Gift Card program provides a double-whammy ... increased sales from the Gift Card, and increased long-term loyalty from the customer purchasing the Gift Card. In many order-entry systems, the customer who purchased the Gift Card has a notation placed in their customer record. Use this information to your advantage!! Web Analytics are wonderful! You can analyze the living daylights out of the myriad of ways customers use a website. Web Analytics are not designed to understand customer behavior over time. In other words, Web Analytics were designed to understand what happened to a customer during a day/session/visit. Multichannel Forensics are designed to illustrate how customers evolve over time. Take the online game company in this example. The diagram at the start of this post illustrate how customers interact with product categories on this website. Most of the new customers like to purchase poker equipment and dart equipment. This is important for search marketers to know ... this is where customer acquisition activities are likely to work best. A secondary group of new customers purchase arcade games and billiards. New customers tend to not purchase furniture, air hockey and foosball. These product classifications must require a bit more trust among the customer than poker equipment, dart equipment, arcade games, or billiards. Once customers purchase from the website for the first time, they begin to migrate to other product classifications. Poker equipment buyers purchase furniture or billiards. Dart equipment buyers migrate to many products, including air hockey, foosball, and billards. Those who buy arcade games migrate to furniture or air hockey. Billiards buyers are very likely to buy other products, including poker equipment, dart equipment, furniture, and foosball. Furniture, foosball, and air hockey product classifications are highly dependent upon customers who buy from other product classifications. This is important from an e-mail marketing standpoint --- you don't market foosball products to arcade game buyers --- these buyers are unlikely to migrate to this product classification. Multichannel Forensics illustrate how customers migrate across a website, over time. The methodology gives tactical leaders in search marketing and e-mail marketing the strategies needed to be successful. Business leaders benefit as well. If I were the General Manager of foosball products, I would make sure I were best friends with the GMs of air hockey, furniture, darts and billiards. Incentives can be aligned properly. The GM of darts should be held to a different standard than the GM of air hockey. The GM of darts must acquire many new customers. If the GM of darts fails, the air hockey GM is less likely to succeed (because dart buyers evolve, eventually buying air hockey products). There will be a lot of examples of this methodology in the new book, along with explanations for the calculations that create these images. Multichannel Forensics are highly complementary to today's Web Analytics packages. A quick way to get started with Multichannel Forensics is to measure three different factors that influence whether your business will grow, or not. Let's assume you manage an e-commerce business. Step 1: How many 2005 buyers did you have? Step 2: What percentage of those buyers purchased again in 2006? Step 3: How much did these buyers spend during 2006? Step 4: How many other customers purchased in 2006? Step 5: How much did these customers spend during 2006? With these five steps, you have the components to do a very simple, high-level Multichannel Forensics analysis --- an analysis of one channel! Step 1 = 100,000 customers purchased in 2005. Step 2 = 35% of these customers purchased again in 2006. Step 3 = These customers spent $200 each. Step 4 = 55,000 other customers purchased during 2006. Step 5: These customers spent $100 each. Total volume = 100,000 * 0.35 * $200 + 55,000 * 100 = $12,500,000. Total buyers to start 2007 with = 100,000 * 0.35 + 55,000 = 90,000. There are two key metrics to pay attention to. First, in Step 2, we notice that the annual repurchase rate is 35%. This means that the online business is in Acquisition Mode. Anytime fewer than 40% of last year's customers are retained, the business is in the business of constantly finding new customers. There is nothing wrong with a business being in Acquisition Mode. However, notice that the business lost 65,000, and only replaced those customers with 55,000 new customers. The business starts 2007 with 90,000 customers, ten thousand fewer customers than it started 2006 with. Let's assume that 2007 repurchase rates and new customers are the same as in 2006. What is our demand forecast for 2007? Forecast = 90,000 * 0.35 * 200 + 55,000 * 100 = $11,800,000. If everything goes as forecast, the business will shrink from $12,500,000 in 2006 to $11,800,000 in 2007. Let's assume the same trends hold in 2008. We'd start the year with 90,000 * 0.35 + 55,000 = 86,500 customers. Forecast = 86,500 * 0.35 * 200 + 55,000 * 100 = $11,555,000. In other words, this business will contract, unless one of three things happen. The annual repurchase rate increases from 35% to maybe 40% or 45%. Purchasers spend more money, on an annual basis. The business significantly invests in new customer acquisition. Businesses that are in Acquisition Mode typically struggle to dramatically increase annual repurchase rates. These businesses need to focus on new customer acquisition, in order to keep growing. Many online businesses are going to fall into this scenario over the next 3-5 years. Once the shift of customers from traditional direct marketing to e-commerce abates, online businesses will focus on carefully managing new customer acquisition counts. 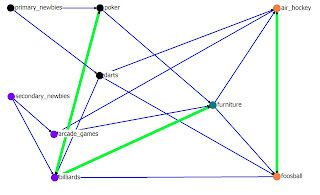 This simple example of Multichannel Forensics illustrates the power of the methodology. The business leader can see into the future, understand how sales are likely to change, and then know which levers need to be pulled to grow the business. Individual tactics (e-mail marketing, online marketing, catalogs) can be employed to achieve the objective. Give it a try, see what it tells you about your business! I received a letter today from the folks at Internet Retailer, stating that their customer information had been breached (which would be my information), including potentially my credit card number and e-mail address. This report has been confirmed on The Breach Blog. Internet Retailer chose to not report their own breach on their homepage, as of 9/18/2007, 3:12pm PDT. Interestingly, Internet Retailer has a long history of talking about security shortcomings, telling others what they must do to improve security. The letter I received does offer an apology, which is appreciated. The letter gives me steps to take to protect my credit information. Internet Retailer does not offer me anything, as a loyal customer, in exchange for a very serious mistake that may significantly impact my life, no discount on a future publication, no free reports, nothing. Obviously, businesses face tremendous challenges protecting customer information. No business is perfect. Evil seeks to disrupt. This is a great example for bloggers, vendors and pundits who constantly poke fun at everybody else, those who constantly criticize companies and individuals for their shortcomings. Today, you are the judge and jury. Tomorrow, it may be you that is being judged. Tell people you have a book coming out, and you get a few questions. Question: How are Multichannel Forensics different than Web Analytics? Multichannel Forensics and Web Analytics are very different disciplines. Web Analytics looks "back" in time, and tells you what customers did during a specific visit to a website. Multichannel Forensics look back in time to understand online customer behavior, then forecast over the next five years how online, retail and catalog sales will evolve. Notice that the methodology views online customer behavior, then illustrates what happens in all channels in the next five years. Question: How are Multichannel Forensics different than Catalog Matchback Analyses? Matchback Analyses are very trendy these days, with dozens of catalog and analytical vendors vying for the right to explain to you how e-mail marketing, online marketing, and catalog/direct marketing work together to cause purchases to happen. Matchback Analyses typically "guess" at what caused customers to purchase, using business rules. Matchback Analyses only look back in time. Multichannel Forensics seldom try to quantify the impact of an individual e-mail marketing campaign, online marketing campaign, or catalog campaign. Instead, Multichannel Forensics quantify the annual impact of an e-mail marketing program, online marketing program, or catalog marketing program on telephone, online and retail channels. This is a fundamental and important difference. Multichannel Forensics is a strategic tool used by CEOs/EVPs to determine the best future strategy for various marketing platforms. Matchback Analyses are tactical tools that can be very beneficial for determining how to allocate a budget. Question: What is the best use of Multichannel Forensics? There are four areas that I really like applying the technology. Understanding the long term impact of eliminating a product, brand or channel. Measuring the long-term impact of various forms of advertising. Identifying the reason why one specific channel is not growing the way management expects the channel to grow. Graphically illustrating how customers interact with advertising, products, brands and channels interact with each other. This morning, I received an e-mail from Amazon. 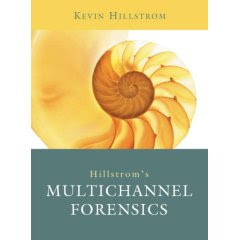 The e-mail said because I previously purchased a book from a different database marketing author, I might be interested in a book being released on September 30, called "Hillstrom's Multichannel Forensics". I am interested in the book. I AM THE AUTHOR OF THE BOOK!!!! I'm guessing I'm not the only person Amazon sent this e-mail to. So it is time to share with you what this new book is all about. The text is the culmination of twelve years of research into how customers behave in a multichannel environment. Twelve years ago, e-commerce began to impact, then influence, then usurp catalog marketing. Peers at competing retailers and catalogers shared their frustration with me about understanding customer behavior in a multichannel environment. Vendors and Research Organizations shared multichannel customer facts and figures that were impressive. They seldom told us meaningful information that helped us understand our customers. And if they had meaningful information, you can be sure the information would be highly monetized! I felt compelled to create a methodology, a framework, for understanding and explaining multichannel customer behavior (in a b2b or a b2c environment). I strongly believed the methodology should do two different things. First, the methodology had to explain how customers interacted with advertising, products, brands and channels ... in a way that a CEO or Executive Vice President could understand. Second, the methodology had to illustrate how sales within products, brands or channels will evolve over the next five years. This allows the CEO or EVP to make decisions today that limit future business challenges. The combination of these factors became "Multichannel Forensics". The perfect laboratory for testing this methodology came during my tenure at Nordstrom. In 2005, we eliminated our catalog marketing program. I used this framework, this methodology, to illustrate what would happen to online and retail net sales growth if catalogs were no longer there to support those channels. Since beginning my own consulting practice in March, I've completed multichannel forensics projects for thirteen brands/titles. I'm continually pleased with the way CEOs and EVPs react to the methodology. I'm proud of the way the methodology forecasts what is likely to happen in the future. I love giving business leaders tools they can use to quell challenges from the Board of Directors, or Ownership Team. There are three ways you can learn about multichannel forensics. You can read this blog. I will continue to give examples of how the methodology can be used in real-life settings. You can read the white paper, which goes into some level of detail on the topic. You can buy the book, and learn the nuts and bolts of the methodology. I want for you to be able to do these projects yourself! Of course, you can hire me to do a project for you. I spend considerable time in the book outlining three-channel situations (i.e. catalog/online/retail or telemarketing/catalog/online, as examples). Two-channel and three-channel situations are very common, hence the focus on these topics. I do not go into the complex simulation algorithms that I use to understand the interaction between, say, ten merchandise divisions and three channels. The concepts in the book are illustrated at a level that allows the reader to build the simulations, if desired. How might you benefit from this book? CEOs and EVPs will learn the current trajectory of the business they manage, and will learn how they might mitigate negative trends. E-Mail Marketers will learn how their oft-criticized discipline builds long-term sales growth. Catalog Marketers will precisely learn the value of catalog marketing in a multichannel environment, in a way that matchback analyses cannot possibly explain. Online Marketers will finally be able to show retail leadership how online customers become retail customers, demonstrating how comp store sales growth is influenced by the online channel. Web Analytics practitioners and Business Intelligence analysts will be able to see how customer behavior can be analyzed longitudinally (over time), providing value that goes well beyond individual session metrics. Multichannel Vendors will be able to identify ways they can provide additional value to the clients they support, value that is targeted at the CEO/EVP level. Amazon is allowing pre-orders of the book in anticipation of a September 30 release date. In the next two weeks, the book will be available on my publisher's website ... www.forbetterbooks.com. Obviously, Amazon is not part of the purchase process if you purchase the book from my publisher's website, Amazon's profit is reallocated among those who invested time, energy and money in creation of the book. I invite you to learn more about Multichannel Forensics. Do so at no cost by downloading the white paper, or purchase the book! My thanks go to Don Libey for shepherding this book and my first book (Hillstrom's Database Marketing), for giving the little guy a chance! Is Your Information Technology Team An "Equal Partner"? In the glory days of multichannel cataloging (i.e. September 2007), if you want to try a new strategy, your team is likely to be different. Online Marketing (search, affiliates, portals, shopping comparison, social media). All of these folks have to work together to execute any new strategy. In your company, is this a "functional team" that works well together, rapidly making joint decisions? Or do you find that a portion of this team makes decisions, and then delegates elements of strategic decisions to certain areas for execution? Most multichannel catalogers have found that they can't execute a multichannel catalog strategy without the folks in the "information technology" department. In some businesses, the "IT" folks are not seen as "equal partners". The "IT" folks are just folks who write code to make things work. Similarly, "IT" folks feel stepped-on. When this happens, you frequently hear about the "huge book of work we have to tackle", you hear about "prioritization of projects". These terms can be code for the real issue ... "since we're not equal partners, we're not working on what is important to you". In so many ways, technology is ruining direct marketing. The business cannot execute true multichannel cataloging without the technology folks. The technology folks cannot feel like they are part of the business if they aren't involved up-front in the development of the strategy. The business cannot afford to have too many "cooks in the kitchen", or gridlock and group-think occurs. In the future, we'll have even more parties demanding a "seat at the table". We'll need to figure out new organizational structures that allow rapid decision making, while still allowing everybody be an "equal partner"
Most important, the information technology folks will have to be "equal partners" in the business, in order for multichannel cataloging to succeed. Why Do You Connect With Certain Articles, And Not With Others? Maybe you noticed that I've been experimenting with a lot of different topics over the past two weeks. It's always interesting to see which articles cause you to visit my site. Index = 100: E-Mail Marketing Quiz, Sale vs. Full-Price. Index = 80: Measuring Multichannel Results. Index = 68: E-Mail Productivity, Is It Waning? Index = 64: Looking For A Few Good Men And Women. Index = 40: E-Mail Marketing Challenge: Assigning Customers To Versions. Index = 15: Catalog Profitability. You seem to like reading about e-mail marketing, multichannel measurement, and topics that relate to sale merchandise. It's always been this way. The two articles that will make you the most money are the two ranked at the very bottom of the list (assigning customers to versions, and catalog profitability). These are areas where I make my living, for crying out loud! People pay me money to capitalize on these topics. Why is it that you are least interested in the articles that make your business the most money? Just curious. The blogosphere provides a wonderful platform to share thoughts about about all the mistakes other people make ... "If I were Steve Jobs, here is how I would have handled the iPhone price discount catastrophe of September 2007. First, I would respect my loyal customers ...". Tonight, I'll focus on ten blunders made during my career. If you have the patience, I'm willing to share several thousand blunders. For now, let's focus on ten. Number 10 = You Can't Go On Strike When You Aren't In A Union: When you are 42 years old, you know how to deal with bad managers. When I was 22 years old, I was under the impression that all managers were like Lee Iacocca. I worked for a leader who, when looking back, was clearly not the worst leader I've worked for. As a 22 year old, I wanted this person OUT! I wasted countless hours thinking about how lousy this person was. I should have spent countless hours learning how to work with a difficult manager. Heck, I remember recommending to a co-worker that we should go "on strike", to protest lousy working conditions. Geez. Number 9 = Screwing Up The First Ninety Days: Some of my most spectacular failures as a Director/Vice President occurred in the first ninety days of a new role. I've set expectations that were too high, causing qualified people to quit. I've set expectations too low, causing a complacency that is much harder to change downstream. The first ninety days in a new role mean EVERYTHING. Surprisingly, your team will be watching your every move during the first ninety days of your tenure. Number 8 = Facts Schmacts: One of my favorite quotes is from Homer Simpson ... "You can use 'facts' to prove that anything is even vaguely true. Facts schmacts." I spent the first seven years of my career trying to convince everybody that I was 'right', by using facts pulled right out of the customer database. Imagine my surprise when I learned that the world wasn't run by facts. My failure was to try to prove to everybody that I was 'right'. It seldom matters that you are right. What matters is doing something that benefits somebody else, while accomplishing an objective that is 'right'. Number 7 = Stop Talking: "Back in the day", I didn't spend a lot of time "listening" to my leaders. I should have spent more time listening to what leaders where really saying with the words they used, and then surprised them with answers that met their needs, not answers that met my needs. Number 6 = Arrogance Doesn't Pay: One of my bosses told me I was brilliant, but I needed to wipe that smug look off of my face. I'm trying hard to be humble these days, though I'm certainly not the arrogant person I was in 1994. And guess what? It took a lot of practice to not be arrogant. I had to change companies to help rebuild my reputation. Number 5 = Gossip Is Poison: Back in 1995, I spread some gossip about a co-worker. Somebody told the co-worker what I said ... the co-worker stopped by my desk, and told me he would never talk to me again about anything unless he had to, because I couldn't be trusted. I'm 6'3" tall, but I felt like I was 6.3 millimeters tall. It might be hard to stay out of the gossip circles. Please try! Number Four = Profit Isn't Everything: My first four years at Nordstrom were a great learning laboratory. I was part of two different management teams. The first management team told everybody what they had to do, and told them exactly how they had to do it ... a "my way or the highway" approach. Our financial results were great. People really didn't like working with us. The second management team had a philosophy on how to do things, but treated people with respect. Our financial results were great. Our 'people' results were so much better. "Paint by numbers" approaches to running a direct-to-consumer business must be balanced with humanity. I spent too much time siding with folks who tore people to shreds, and the stink from those first two years stuck to my reputation for years. Number Three = Audit Results: I already told many of you about the time in 1995 when I had to select the best 1,000,000 customers for a womens catalog. My job was to also pick 300,000 customers to place into a contingency file. I pulled the best 1,300,000 customers, sorted them in ascending order of likelihood to purchase (instead of descending order), and incorrectly selected customers 300,001 to 1,300,000. Within three days of the in-home date of the catalog, I learned that I was the reason the catalog was missing plan by forty percent. The lesson I learned ... AUDIT EVERYTHING YOU DO, OVER AND OVER AND OVER!! Number Two = Audit Results: This sounds a lot like the last lesson. If you are a Director/VP, you must have ways of knowing that your team executed things correctly. Make sure you put policies and procedures in place to prove that your team did their job correctly. Make sure your team follows those policies and procedures. You don't ever want to be in another Exec's office and have the Exec tell you "I want blood", after learning that your team made a big mistake that cost the company money. I've been in that room, I've heard that comment uttered from an Exec. Number One = Technology Isn't The Answer: It took becoming a Vice President to truly understand that nothing happens without people. I used to be a technology person. I thought all the problems at Eddie Bauer could be solved if we simply implemented cannibalization models for catalogs, gravity models for real estate selection, regression models for selecting customers for catalogs, you name it. I was wrong. And then, you experience those brief moments in time, times when the right combination of people create magic. I experienced magic working with the right combination of people (in NASCAR, they call this 'chemistry') in 1993-1994 at Lands' End, in 1999 at Eddie Bauer, in 2004 at Nordstrom Direct, and my 2005 Database Marketing team at Nordstrom, the best group of Database Marketing individuals I've ever worked with. You get the right leadership team working with a willing supporting cast, and you can overcome anything. Brilliant people OVERCOME bad technology. Brilliant technology can't overcome a mediocre team. I'm frequently asked what the ROI is of my blogging efforts. Year-to-date, 30% of my project work is sourced from folks who subscribe to my blog, or found the blog via a search. If you're a small business, and you're willing to give your audience something tangible, something they can actually use, you should be able to realize a positive ROI for your efforts. Deciding who receives a version of an e-mail campaign is a challenge. You seldom read common-sense logic that explains what you should do, partly because it is hard work, partly because vendors want to monetize this process by doing the work for you. Let's review a simple example, one that clearly outlines the challenges we all face. The table below illustrates seven e-mail subscribers, and the amount each customer spent on Mens and Womens merchandise over the past year. Based on the purchase habits of these seven individuals, we have to assign three customers to the Mens version, and four customers to the Womens version. Method #1 = Prioritization: One of the easiest strategies is to prioritize one version of the e-mail campaign over another. In other words, the database marketer may decide that the Mens version receives top priority. In that situation, the three highest-spending Mens customers get the Mens version, with everybody else receiving the Womens version. Mens Version = Customer Number Three, Five and Seven. Womens Version = Customer Number One, Two, Four and Six. Notice the challenge with this method. While this is the easiest method to execute, the method results in the version with the highest priority receiving the best customers. This means that the version with the highest priority will generally perform best. The version with lower priority will generally not perform as well. Mens Version = Customer Number One and Three. Womens Version = Customer Number Two and Six. Ties = Customer Number Four, Five and Seven. The database marketer could randomly decide which of the three customers with ties receives the Mens version, and then allocate the other customers to the Womens version. When we score each customer based on expected sales per e-mail sent, we see a problem, don't we? The Mens version is expected to perform half as well as the Womens version. So, when evaluating each version of the e-mail campaign, we come to the logical conclusion that we should only have one version of the e-mail campaign ... the Womens version ... right? Now go sit down in the office of the Mens Merchandise Executive, and tell him/her that we won't be sending an a Mens e-mail to our customers, because customers don't respond to Mens merchandise. After you make that statement, cover your ears and duck!!!! So, you're left with a tough choice. What you have to do is assign the best customers to versions, "subject to constraints". In this case, the constraint is that we have to send three Mens e-mail versions to customers, yet we want to maximize the total ROI for the campaign. A good tool to solve this problem is "linear programming". I don't have enough room to go into all the math here, but if you use software from Unica (the folks who brought catalogers the "Affinium" campaign management tool), you can purchase an add-on that does this for you. The add-on isn't cheap, but you're likely to recoup your profit in short order. Of course, there are many, MANY ways to solve this problem. Here's an opportunity for you to share your thoughts. How would you attack this challenge? You are the e-mail Executive at a multichannel brand. You run a series of tests, measuring how promotions work against an e-mail merchandising strategy offering customers compelling merchandise at full price. % Of Delivered E-Mails With Clicks = 3%. % Of Clicks Converting To A Purchase = 2%. Purchasers Per 100,000 E-Mails Delivered = 60. Demand Per E-Mail = 0.03 * 0.02 * 100 = $0.06. Profit Per E-Mail = $0.018. % Of Delivered E-Mails With Clicks = 5%. % Of Clicks Converting To A Purchase = 3.5%. Purchasers Per 100,000 E-Mails Delivered = 175. Average Order Size = $110. Demand Per E-Mail = 0.05 * 0.035 * 110 = $0.1925. Profit Per E-Mail = $0.026. Clearly, customers respond to promotions. Your Chief Merchant and Chief Marketing Officer do not want to make your business "promotional" in nature. Promotions hurt the gross margin. Your Chief Merchant receives a healthy bonus if gross margin percentage is very high. Your Chief Marketing Officer hates promotions, because she has been charged with growing a full-price brand. Fortunately, the decision is yours. You are accountable for the e-mail marketing program, and you receive a healthy bonus if you grow e-mail demand, year-over-year. Do you go with a low-response, full-price strategy? Or do you go with a promotional strategy that makes you look good, but fails to build partnerships with other executives? Do you "split the difference"? Those of us who have been in the catalog industry since 1995 know that we are going through a period of significant transition. We may not always acknowledge this fact. But it is happening. To use broad generalizations, Baby Boomers fueled rampant catalog sales growth in the 1980s and 1990s. Gen-X brought us e-commerce and e-mail marketing. Millennials are fueling social networking, and in many cases are ignoring "traditional advertising". If you are a cataloger with a target customer this is sixty years old, you might be insulated from this period of transition, only impacted by increasing paper and postage costs. If you are cataloger with a target customer that is forty or forty-five years old, you are going through a significant transition. A generation of print-responsive customers are being replaced by a generation of e-commerce customers. In the next ten years, your print-responsive customers will be a minority of your business. Even more fascinating is the fact that in ten years, your e-commerce and e-mail business will be going through a "transition", thanks to dramatically different shopping behavior exhibited by Millennials. We simply can't envision how this generation will shop when they are forty years old. It is highly unlikely they will embrace catalogs or e-commerce as we know it today. They will probably create their own version of internet shopping. Regardless, direct-to-consumer shopping will be very different from what we know today as "e-commerce". We'll be reading articles from today's e-commerce and e-mail experts about how "E-commerce isn't dead, it's still highly relevant ... Amazon is spending $400 million on an online marketing campaign featuring Gwen Stefani". I lived through catalog transition during my time at Nordstrom. I watched a $400,000,000 telephone-based business collapse. I watched an e-commerce business grow from zero to a half-billion dollars. I actively participated in the tough decisions that result in marketing dollars being reallocated to e-commerce and "multichannel". I mourned as the catalog talent pool, my friends, were replaced by e-commerce, "multichannel" and "consumer intelligence" skill sets. My team artfully and willingly transitioned their skills to remain relevant in a post-catalog world. And I rejoiced in my own renaissance!! I was able to re-brand myself as a subject matter expert in forecasting how customer behavior changes over time, across products, brands and channels. As it turned out, this transition was tremendously positive for me. My experiences going through the "transition" are so very important to the work I do for clients today. If you are experiencing the transition of a career that was built on paper, this Vanity Fair article (forwarded by loyal reader Jennifer Thornton) should resonate with you: "Is This the End of News?". The author artfully describes the transition he is experiencing in the news business, using common-sense language and everyday situations to describe how the internet, and differences in generational habits, are putting pressure on his career. I felt the best part of the article was the way the author recognized all of the changes in his field, and is taking a chance on influencing the way news is presented to folks in the future. He may be right, he may be wrong. At least the author is positively using the transition of the news industry to try something different. Time for your thoughts. Do you agree with the premise that cataloging is going through a significant transition? If you agree, how are you rolling with the punches? "The direct marketing industry has been changing at a feverish pitch. First came email, then blogs, RSS feeds, rich media, word of mouth, viral, social networking and user-generated content. The SMDA is evolving right along with it, and we'll soon be introducing a new tag line "Thinking Outside The Mailbox" to help define the SDMA for the future." "In case there were any lingering thoughts that the printed word is dead, consider this: Hewlett-Packard has launched a $300 million-plus, integrated marketing campaign that reflects just how important printing-related services and products are to the company ... the campaign is one way HP is trying to drive its Print 2.0 strategy ..."
Maybe it has always been this way, but the marketing voices we have to listen to seem to want to polarize us. The "shopping comparison site" booth. The "word of mouth and viral marketing" booth. The "multichannel marketing and operations" booth. The "business intelligence and SAS programming" booth. Each booth has a small but fiercely loyal tribe of believers. Each tribe is able to "prove" to you why they are right. And each tribe "is" right ... to an extent. I want to be presented with a bowl of direct marketing cioppino. Instead, all I see are cutting boards full of uncooked ingredients, arguing with each other about why each individual ingredient is best.